Contact information for School of Music academic and professional staff, with links to academic research pages. Read the latest news from the School of Music, or learn of upcoming concerts, events and seminars. Study with us, and learn about majors, courses, scholarships, and prizes. The School of Music has a strong and enduring commitment to outreach into the wider community. Book a venue, a recording studio, rehearsal rooms, musicians, or equipment from the ANU School of Music. Situated in the heart of the nation’s capital, and on the campus of Australia’s foremost research university, the Australian National University School of Music has a proud and rich history. 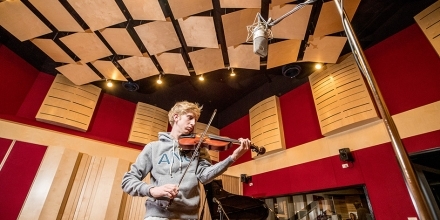 The ANU School of Music is home to one of the most technologically advanced recording facilities in Australia. Featuring a 9m2 double height, custom acoustically treated recording studio floor with variable wall panelling for flexible acoustic response, our main studio can accommodate large and small ensembles across all musical styles. Our facility also includes an oversized vocal booth designed to accommodate all vocal performance styles as well as isolate guitar amplifiers. At the heart of our Control Room A is a custom made Neve Genesys G96 mixing console, one of the largest custom desks of its kind. As an AVID Learning Partner, the ANU School of Music is always at the cutting edge of music production; we currently run AVID Pro Tools HD 12.8 as our main DAW alongside Steinberg Wavelab and Apple Logic Pro. Our monitoring is DynAudio throughout with an AIR20 Series 5.1 Surround Sound system installed in our main control room. 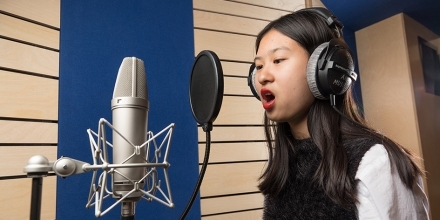 The School recording studio is also home to an unparalleled collection of vintage and contemporary microphones including many Neumann, Schoeps and Blue, as well as an enviable range of gold-standard outboard allowing for perfect recordings across all styles and instruments, solo and ensembles. 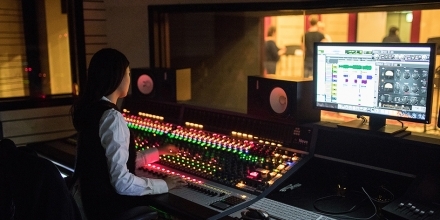 Our School’s facilities are consolidated with two custom designed and acoustically treated post production mix suites as well as a cutting-edge, 21-workstation music technology lab. Limited evening and weekend bookings by arrangement. Bookings limited. Commercial bookings available.